The London Cycle Network aims to improve Londonâ€™s infrastructure for cyclists so that cycling is a viable option for those living and working in the UK capital. The Mayorâ€™s Transport Strategy sets out a framework for improving the way transport operates in London and a growth in cycling is integral to this vision. Cycling can make a significant contribution to meeting Londonâ€™s mobility and access needs as well as helping to realise energy, health, and social objectives. The purpose of this project is to have a positive impact on the level of cycling via a well-designed cycle network that is fast, safe, convenient and easy to use so that Londoners have cycling as a viable option for at least some of their journeys. 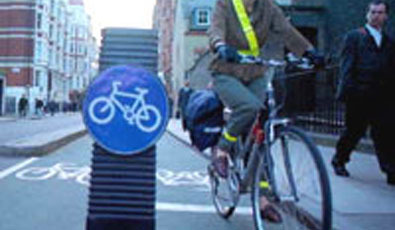 London Cycling Design Standards have been developed as a result of The London Cycling Action Plan which sets out the standards for reducing barriers to cycling. It includes details on appropriate changes to junctions and crossings, signs and markings, construction including surfacing and cycle parking. In addition, Cycle Route Implementation Stakeholder Plan (CRISP) processes have been developed to aid and assess London Boroughs in designing and implementing their cycling schemes. During 2004/05 a total of approx. 63.8km of the London Cycle Network (LCN) was delivered, 329km of the network was studied through CRISP or feasibility studies and 34km of designs were advanced. During 2005/06 92 CRISP studies were commissioned and 27 were finalized representing 339.46km of the network length. Also completed in 2005/06 were 38 studies commissioned in the 2004/05 program. The remaining CRISP studies will continue in 2006/07 with completion of studies on all Links by 2007/08. At the end of 2005/06 the total length of the LCN was 495km, over 50% of the total length target of 900km by completion of the project in 2009/10.